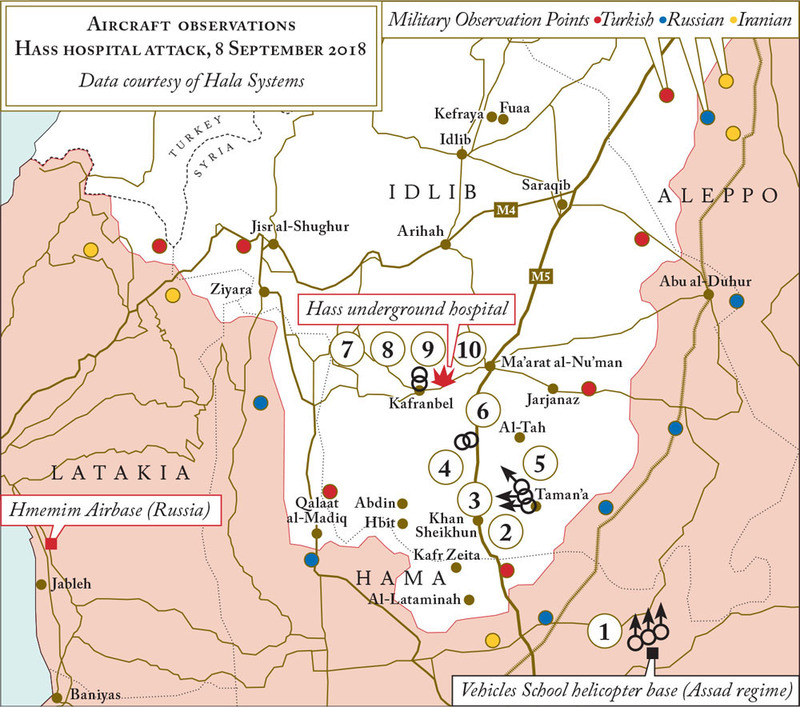 Medical and rescue facilities in opposition held areas have frequently been the target of air strikes by pro-government forces, and what appeared to be the opening stages of the Battle for Idlib was no different. 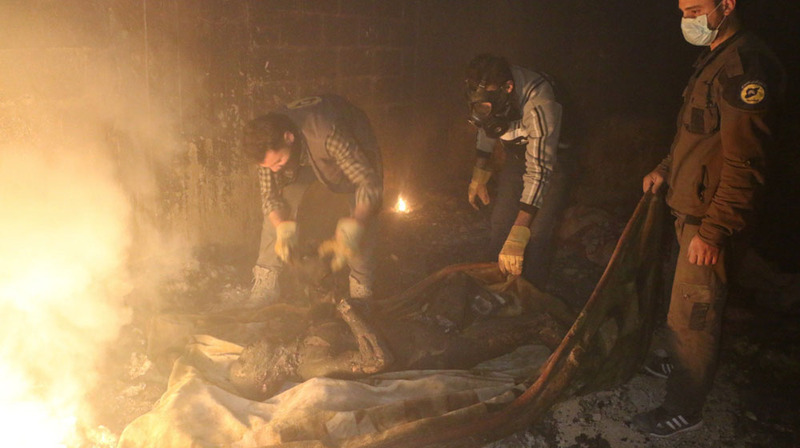 On September 6th 2018 the Syrian Civil Defence Twitter account posted images of what was described as a White Helmets centre that had gone out of service following a massive attack on the Idlib countryside. And on September 8th, Hass underground hospital was targeted in airstrikes, with multiple videos from the hospital shared online following the attack. Read the full article online at Bellingcat. 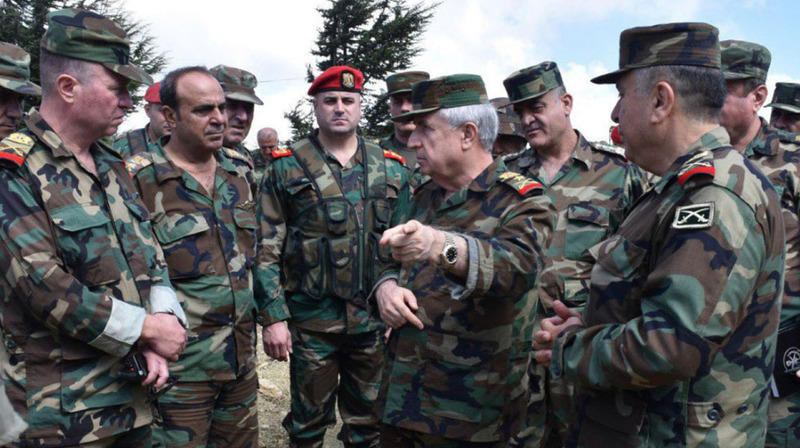 14.54–15.13: Multiple Syrian Regime Mi-8 helicopters sighted flying north from the Vehicles School helicopter base in Hama. 15.09: Syrian Regime Mi-8 helicopter sighted flying west near Taman’a, Idlib. 15.17: Syrian Regime Mi-8 helicopter sighted flying west near Taman’a. 15.20: Syrian Regime Mi-8 helicopter sighted circling near Heish, Idlib. 15.28: Syrian Regime Mi-8 helicopter sighted flying northwest near Taman’a. 15.30: Syrian Regime Mi-8 helicopter sighted circling near Heish. 15.34: Syrian Regime Mi-8 helicopter sighted circling near Kafranbel, Idlib. 15.37: First report of an airstrike against Sham Hospital in Hass, Idlib. 15.41: Syrian Regime Mi-8 helicopter sighted circling near Kafranbel. 15.48: Second report of an airstrike against Sham Hospital in Hass. Data courtesy of Hala Systems.